We spent last night in a Motel 6 in San Luis Obispo (No, not Walmart parking lot) After a hearty breakfast at Mickey D's, we drove to Santa Barbara and found Westmont College. We found the admissions office and were given some helpful info and they even arranged a tour for us. The campus is very nice, located in ritzy Montecito, with beautifully landscaped pathways. The college seems to focus on a strong relational christian liberal arts education. It has a relatively small enrollment which is kept that way because of the town's restrictions. After a late picnic lunch at the Santa Barbara mission, we quickly cruised off to Malibu to catch the admissions office open at Pepperdine. Fortunately, Andy Olson, who attends the University was available to spend the evening with us. We weren't too impressed with the admissions office-"here are some pamphlets and you can watch interactive video tour" But it was great to have Andy there who gave us an inside look at the campus. 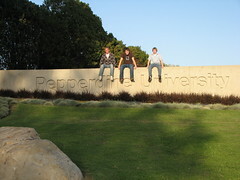 He did a great job of explaining his own appreciation of his education at Pepperdine. The campus is amazing. It reeks of wealth - BMW's Mercedes, Lexus, architecturally unified buildings on a breathtaking piece of property overlooking the Pacific. The students which we met through Andy seemed to be very friendly and appreciative of their opportunity to study at Pepperdine. After a late supper in town with Andy, we were off to the big city of LA to find lodging for the night. Esther was a little worried as we raced through Santa Monica and Beverly Hills, but we headed for the San Fernando Valley for some 'reasonable' housing. We stumbled onto Sepulveda Blvd. and found a suitable 'has been' motel and turned in at 9pm.